Speculations of autonomous vehicle futures question if these technological developments will totally transform urban landscapes as nothing since the automobile itself, or merely resolve current logistical issues with intelligent and networked infrastructure. While the magnitude is in question, change is assured. 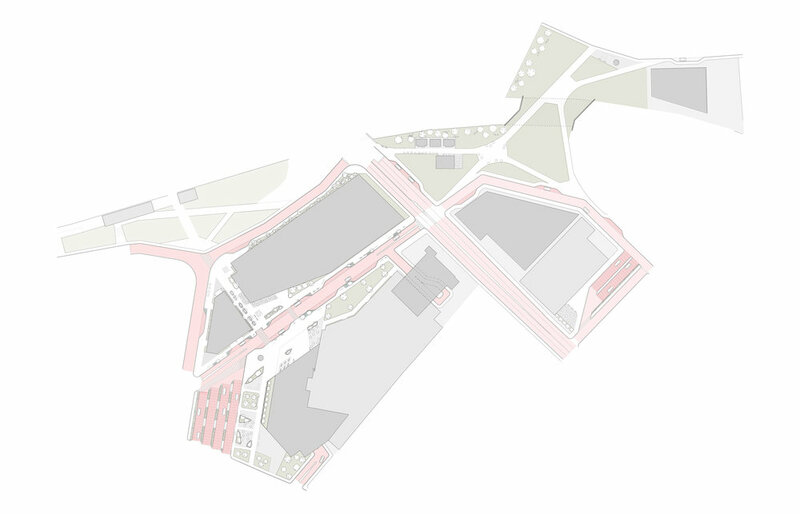 This speculative investigation of AV Urbanism attempts to explore the potential impacts of AV-technology, good and bad. 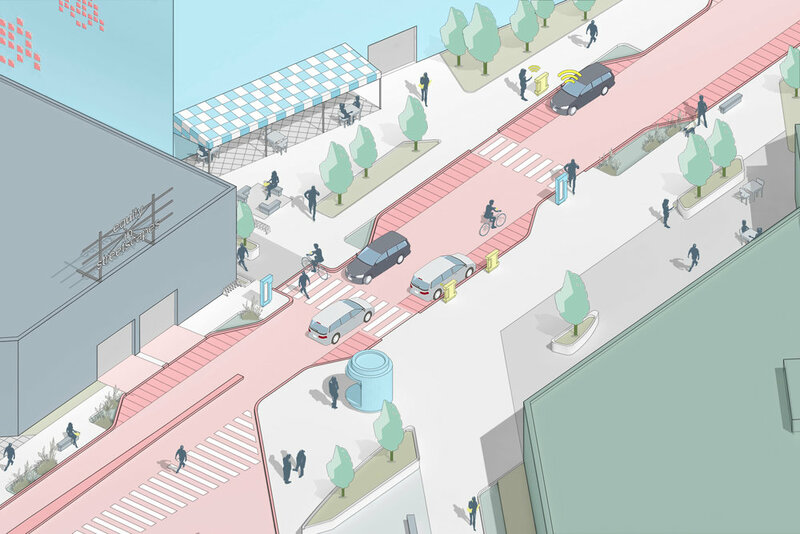 Focused on equity, connectivity, and pedestrian-prioritized access within Transit-Oriented-Development, this proposal attempts to keep people engaged to one another, and to the world they inhabit. One potential danger identified within an AV future is the enabling of an "airport" effect . This effect is characterized by developments designed to function as arcology islands that attempt to consume as many facets of life as they may, and through AV-technology network ubiquitous development to ubiquitous development, isolating people from the urban experience, and from one another. To avoid this effect, it is recommended AV technology integrate with existing street-grids to strengthen urban connections across scales. Paired with pedestrian-prioritized street-edge development, it creates multi-modal and mixed-use opportunities for AV-enabled TOD that strengthens the existing urban realm. 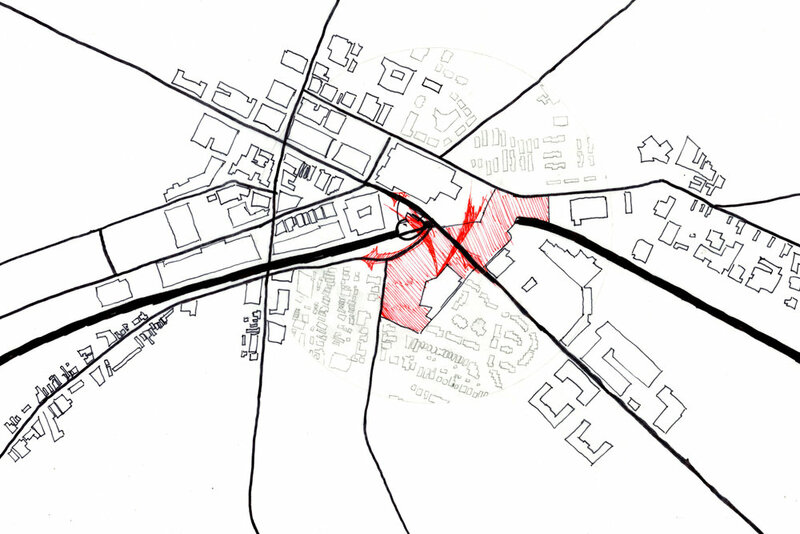 In order to determine potential sites to test AV strategies, an urban analysis of Pittsburgh and the greater metropolitan area to analyze the city's existing transit network of railroads, inclines, light-rail, highways, and busways. This analysis determined major roads that maximize the potential catchment area of a city AV network. 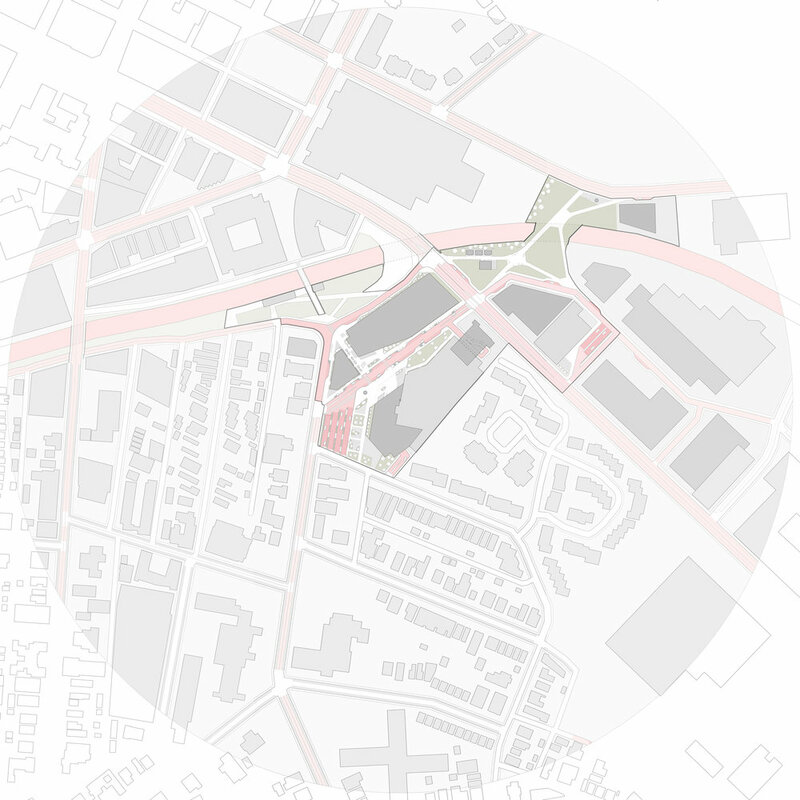 The regional analysis revealed the particular significance of the Baum-Centre corridor within the city's existing automobile infrastructure. Further analysis of building typologies along the corridor determined 'districts' of attraction. Institutions (black), mixed-use developments (red), retail (grey), cultural buildings (blue), grocery stores & restaurants (green), and auto-related buildings (yellow) targeted critical potential sites within the corridor. The MLK Busway is the primary E-W public transit connector from Pittsburgh's downtown to its East End. Towards the western end of the Baum-Centre corridor is an existing bus-only ramp connecting the corridor and busway. The top of this ramp is currently under-developed, but turning the busway into an AV HOV highway could increase ridership and provide a point of lateral transfer between the E-W busway and the N-S Neville St..
Where the MLK Busway crosses beneath the Baum-Centre corridor sits the historic Ford Motors Building, a former automobile factory that vertically bridges the 7-stories from the Busway to street level. Adjacent to UPMC Shadyside, the building is an ideal point for a new Busway stop, and point of mode transfer from automobile to bus, and from a citywide HOV AV highway to more local pedestrian and bicycle connections. Where Negley Ave meets the Baum-Centre corridor, there is both intense traffic congestion and a high-traffic destination in the Giant-Eagle Market District. To address both conditions, pedestrian bridges can span the Busway and link the Ellsworth and Baum-Centre corridors, creating longitudinally connective points that strengthen pedestrian connections between neighborhoods to the north and south of the corridor. Anchoring the eastern end of the Baum-Centre corridor is a site that contends with all of the opportunities and challenges of the previous three sites, and therefore presents the ideal test site for studying an AV future. Surrounding, the existing Shakespeare Giant Eagle is a series of oversized parking lots that present the opportunity for a series of connective opportunities through pedestrian connections towards the underserved Larimer community, developing the northern terminus of Shady Ave. into a densified retail corridor, and to extend pedestrian connections from the existing E. Bond development and MLK Busway stop. 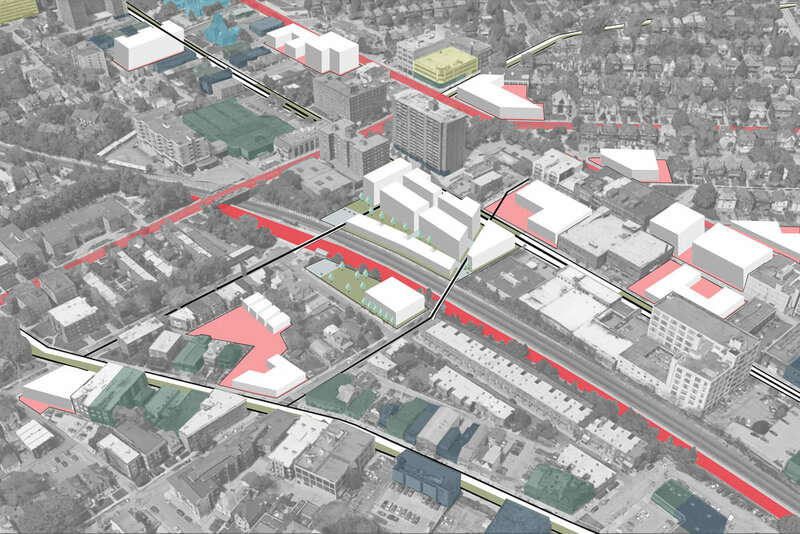 Working off of the site's connective opportunities to the Shadyside, Squirrel Hill, E. Liberty, Larimer, and Garfield neighborhoods, the above massing strategy was developed to take maximum advantage of the site's edge condition. The creation of an interior automotive slow-street that deflects off of the terminus of Shady Ave creates makes the site an ideal point to transfer from automobiles or pedestrian route to the Busway. In addition, pedestrian connections to Larimer and downtown E. Liberty strengthen the site's and existing grocery store's pedestrian connections to the undeserved communities they serve*. *Demographic Analysis for the Shakespeare Giant Eagle and neighboring Trader Joes and Whole Foods were based upon research conducted under the guidance of Professor Kristen Hughes' survey Designing With Community. Thus the resultant TOD strategy was developed which focuses on creating an internal pedestrian 'plaza' with pedestrian-prioritzed slow-streets and significant street-edge amenities. This creates a maximized amount of frontage within the site and allows for mixed-use additions to be made to the existing Giant Eagle building. Capitalizing on the lack of open space in the surrounding area then, a cross-Busway pedestrian park is made that links to the surrounding developments and reflects a prediction of increasingly blurred distinction of public and private investment in an AV society, as it links numerous private developments but provides an equitable and open public amenity for all.